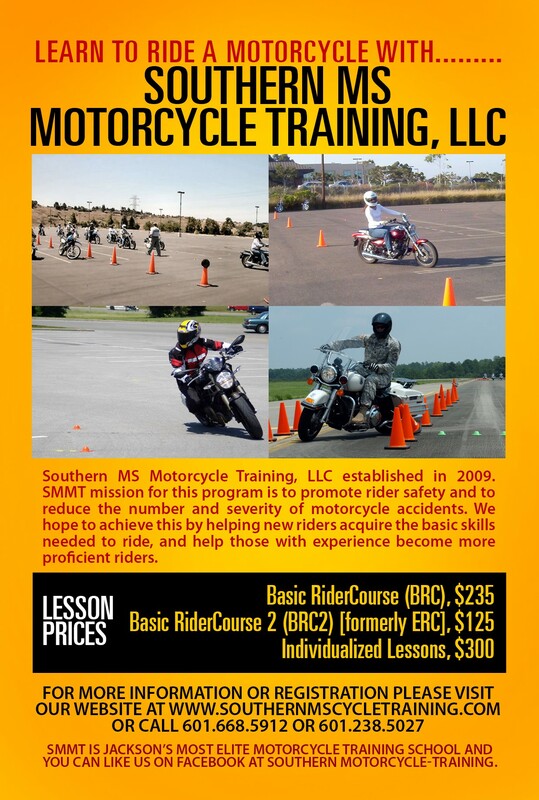 Southern MS Motorcycle Training (SMMT), is a locally owned motorcycle training course in Jackson, Mississippi. SMMT basic course is designed to teach motorcycle riders the basic skills needed to safely ride a motorcycle. Our training course goals are to advance experienced riders to be better riders and to train basic beginner riders to be experienced riders. We are the place to be if you have never experienced "that ride" on a motorcycle before or if you have been riding for years and desire to get your motorcycle endorsement on your license. If you are willing to invest your time in learning to ride the right way before "hopping a ride", we are eager to teach you the dynamics of a good, safe rider on the roadways. The most important goal of this training course is to emphasize and utilize different safety tips and methods to be used on the roadways when riding your motorcycle, upon completion of this course. Our certified rider coaches are seasoned, professional riders who are committed to providing quality training. SMMT RiderCoaches have certification thru the Motorcycle Safety Foundation and have a background in Law Enforcement Motorcycle Training. The training process is intensive, but our Rider Coaches are committed to (70+ hours) of hands on training. We have present and former RiderCoaches with bios that include being members of the Police Department-Motorcycle Division, as well as Active Military, who are certified to teach all walks of life who wish to "ride". With that being said, we welcome all Beginner Riders, Experienced Riders, Soldiers, DOD Civilians, Retirees, and Dependents who desire to become motorcycle riders. SMMT courses are taught at three levels: The Basic Rider Course (BRC) for new riders, the Basic Rider Course 2 (BRC2) for experienced riders, and Individual Rider Lessons (IRL) for the rider preferring a one-on-one training instruction. Upon successful completion of the rider training course, you the "Rider" will be exempt from the riding portion of the test administered by the MS Department of Public Safety for your motorcycle endorsement. * Motorcycle endorsement will be added to valid driver's license once your licensing requirements have been met.